When you look at the nutritional benefits of flax seeds, there are many things that will catch your attention. The journal of Nutrition and Metabolism found that adding flax seeds into your diet can naturally reduce cholesterol levels. The soluble fiber content of flax seeds trap fat and cholesterol in the digestive system so that it unable to be absorbed. Soluble fiber also traps bile, which is made from cholesterol in the gallbladder. The bile is then excreted through the digestive system, forcing the body to make more, using up excess cholesterol in the blood and lowering cholesterol overall. Using flax is a great way to naturally replace gluten-containing grains which are inflammatory where flax is anti-inflammatory. So, flax seeds are great for those who have Celiac disease or have a gluten-sensitivity. They may also be a good alternative to omega-3 fats in fish for people with a seafood allergy. Another great aspect of flax being gluten-free is that it can be used as a grain-free option in cooking. I will often use it along with coconut flour in baking at home. Amongst its other incredible nutrition facts, flax seeds are also packed with antioxidants. Lignans are unique fiber-related polyphenols that provide us with antioxidant benefits for anti-aging, hormone balance and cellular health. Lignans are also known for their anti-viral and antibacterial properties, therefore consuming flax regularly may help reduce the number or severity of colds and flus. Maybe the biggest flax seed benefits come from it’s ability to promote digestive health. The ALA in flax can help protect the lining of the digestive tract and maintain GI health. It has been shown to be beneficial for people suffering from Crohn’s disease or other digestive ailments, as it can help reduce gut inflammation. You can also take 1-3 tbsp of flax seed oil with 8 oz of carrot juice to help naturally relieve constipation. Flax is also very high in soluble and insoluble fiber which can also improve digestive health and is one of the highest magnesium foods in the world. Two tablespoons of flaxseeds contains about 5 g of fiber or 1/4 of the RDA. The fiber found in flaxseeds provides food for friendly bacteria in your colon that can help cleanse waste from your system. Flax seed benefits have been proven time and time again and even including fighting breast, prostate, ovarian and colon cancer. A study published in the Journal of Clinical Cancer Research discovered that consuming flax seeds may decrease the risk of breast cancer. 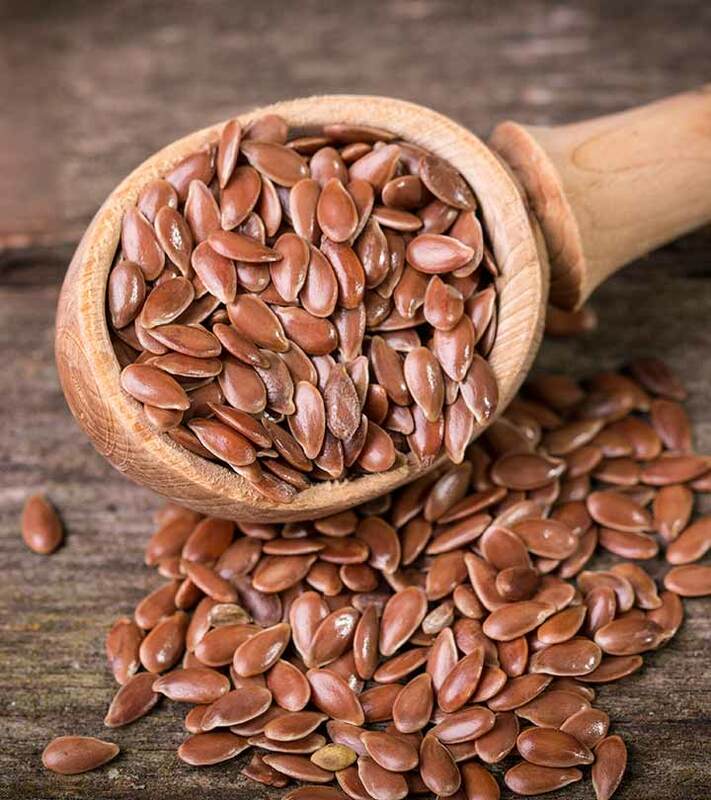 The three lignans found in flaxseeds can be converted by intestinal bacteria into enterolactone and enterodiol which naturally balance hormones which may be the reason flax seeds reduce the risk of breast cancer. 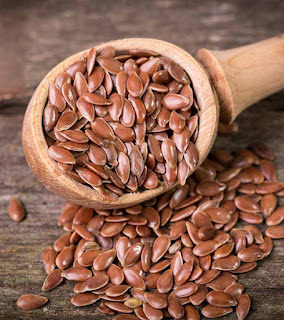 Another study published in the Journal of Nutrition found that the lignans in flaxseeds may also reduce the risk of endometrial and ovarian cancer. We hear a lot about the health benefits of fish oil or omega-3 fats. Fish oil contains EPA and DHA, two omega-3 fats that are critical for optimal health. Although flaxseeds do not contain EPA or DHA, they do contain ALA, another type of omega-3 fat. A study published in Nutrition Reviews has shown that approximately 20% of ALA can be converted into EPA, but only .5% of ALA is converted into DHA. Also, surprisingly gender may play a big role in conversion where young women had a 2.5-fold greater rate than men. Regardless of conversion, ALA is still considered a healthy fat and should be included in a balanced diet. To experience the flax seed benefits for your hormones include 1-2 tbsp of flax meal in a breakfast smoothie along with 1 tbsp of flax seed oil.